Lourdes Central School celebrated the International Yoga Day on 21st June 2018 as a part of the Nationwide Celebrations. The event commenced at 8.00 a.m with a prayer song sung by the choir members. The welcome address was delivered by Vaishnavi. The significance of the day was given by Haya.She said that the inner peace and harmony was the main aim of Yoga.It was also mentioned that the 1st yoga day in the nation was celebrated on 31st June 2014. 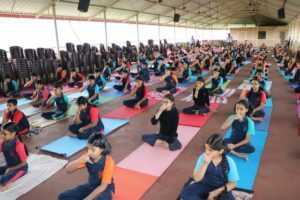 Various yogasanas like Thadasana,Vrakshasana, Pashwakonaasana, Padahasthaasana, Pranayama and Nadishudhaasanas were performed by a student (Manasi),and the physical education teacher Mr Veerendra Alva. The Vice Principal Mrs Belita Mascarenhas addressed the gathering. She encouraged the students to perform Yoga as it benefits a healthy brain and body.The Vice- Principal also said that Yoga improves our concentration ,health and relaxes all the parts of the body. Maam assured the students that by practicing Yoga all will have a long and healthy life.She advised the students to practice Pranayama for 5 minutes whenever possible during the day.All the students of classes 6 were present for programme. Manasi delivered the Vote of thanks. The International Yoga day was a great success.